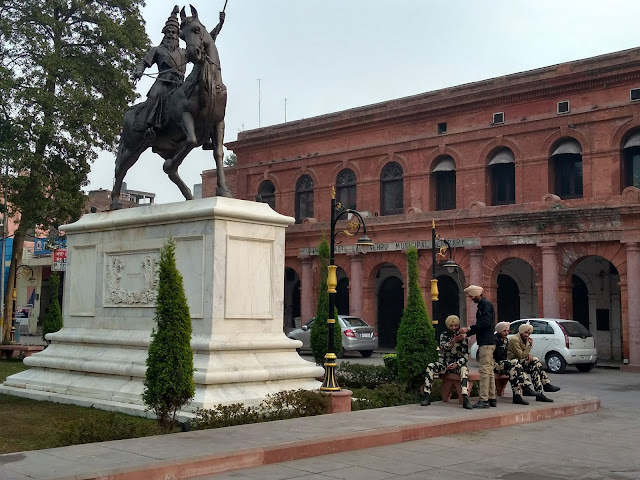 Our first stop in Amritsar was the Partition Museum. Recently opened, it is the first museum dedicated to bringing together materials that record the tragic history of Partition and the stories of survivors. We spent two days there. The stories, on video and audio, and almost all from the Indian side, were horrific but also moving, demonstrating as they did both the savagery, and the heroism and compassion, that humans are capable of. 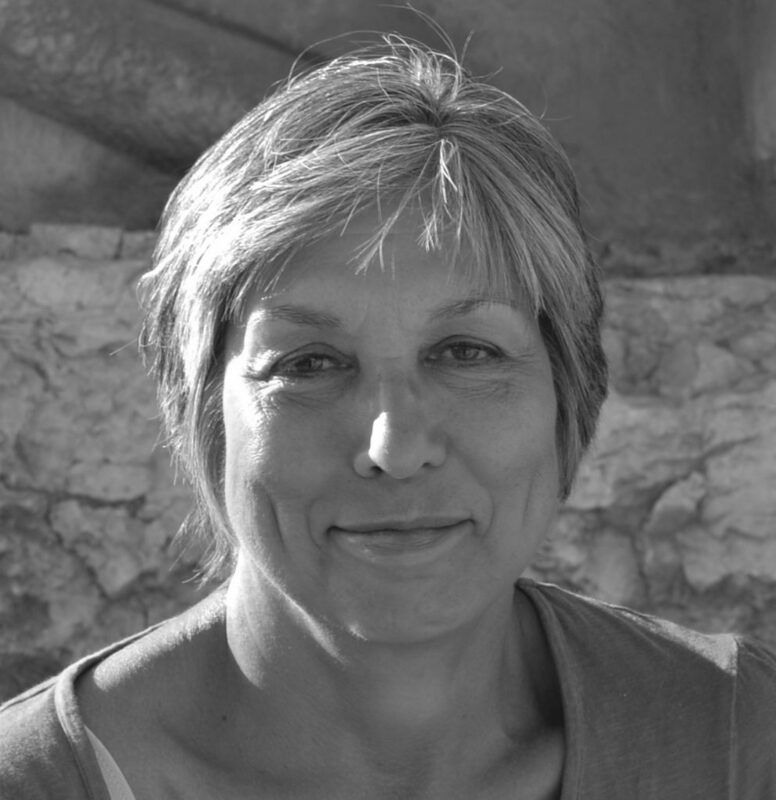 My daughter, India Stoughton, also set up interviews with Mallika Ahluwalia, one of the founders of the museum, and Guneeta Bhalla, who began the Partition Archive as a young student after hearing her grandmother’s story of Partition, with no funding, but by enrolling other volunteers to record their grandparents’ stories. She also spoke to two young men from Bolti Kidki – one Indian, the other Pakistani – who between them have collected audio recordings which they share on their Facebook page. Most of these initiatives seem to have been started by young people who have realised the importance of capturing their grandparents’ stories while they can. During the days we spent in Delhi and Amritsar, people we met in hotels, or through our host organisations, mentioned friends who had lived through Partition as children or teenagers and I was lucky enough to meet four of them and record their stories. Not all of them were dramatic, but the details of how people escaped, what was happening, transport available, etc, were very useful to provide the sort of everyday detail one needs for fiction that it’s hard to get from books. Two days into our stay we had to change hotels because the first one we were in was so damp that I developed a chest infection. We moved to another one where our host, Harjot, took care of us like a mother, making me Ayurvedic soups and desserts, guaranteed to cure me overnight (they didn’t but they were delicious). She insisted that we accompany her to the Golden Temple because it was Guru Gobind Singh‘s birthday, the most auspicious day to visit. I really wanted to go to bed but I’m glad we went because it was magical. Of all the religious centres I have visited, the Golden Temple was the most welcoming. Harjot explained that it has four entrances – north, south, east and west – symbolising that everyone is welcome, whatever their religion and wherever they come from, and this was evident in the smiles and greetings from everyone we saw, including the fearsome looking guards with their spears. Food is also served to everyone who visits, regardless of caste or religion. I drew the line at going for dip in the freezing water – like everywhere we went in North India, it was cold and foggy – but Harjot did. And as night fell the view became even more magical. We also took a tour of the city. A new grand ‘Heritage Street’ has been built with a fake sandstone facade lined with shops and restaurants and hotels to attract tourists. Meanwhile, in the backstreets and narrow alleys, genuine heritage buildings are being left to decay. 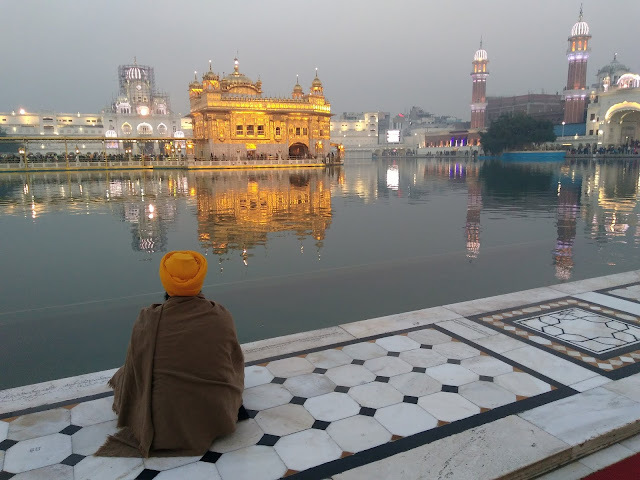 Harjot recommended a guide, Gurinder Singh Johal, who specialises in Heritage tours, and we spent a day with him wandering through the alleys, narrowly avoiding being mown down by motorbikes and rickshaws. It was a fascinating day, learning the history of each building, going into little temples that are hidden away, and disused decorated with exquisite murals that are crumbling into ruin. The hand pointing downwards on the left hand corner of the carved eaves under the green section, is common to most of these old buildings and symbolises the humility that seems to characterise Sikhism – a reminder that none of us is superior to another, no matter how tall our houses are. For anyone wanting to know more about old Amritsar, there’s a more comprehensive blog about it: Memoirs of an Average Joe, with pictures. While in Delhi, I had mentioned to Sqn. Ldr. Rana Chhina, of the Centre for Armed Forces Historical Research, that I wanted to visit a farm and see something of Punjabi rural life. 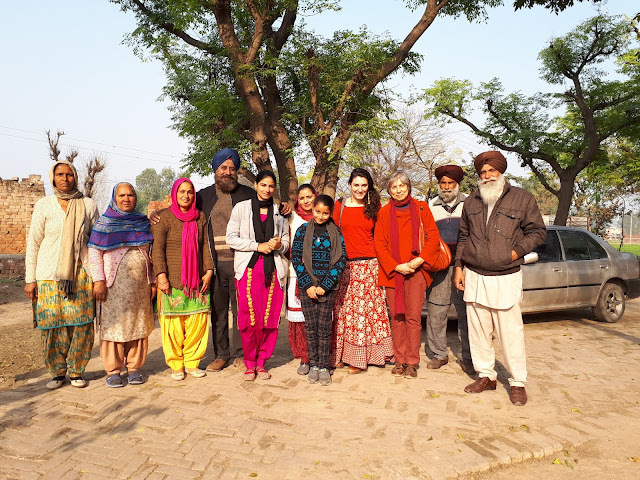 As if he had not already been hospitable and helpful enough, he mentioned that he would be visiting his family farm near Amritsar while we were there and invited us out there for a day. This was an opportunity too good to pass up. We arrived to a warm welcome, and a delicious lunch, and were shown around the farm and taken on a tour of the village. 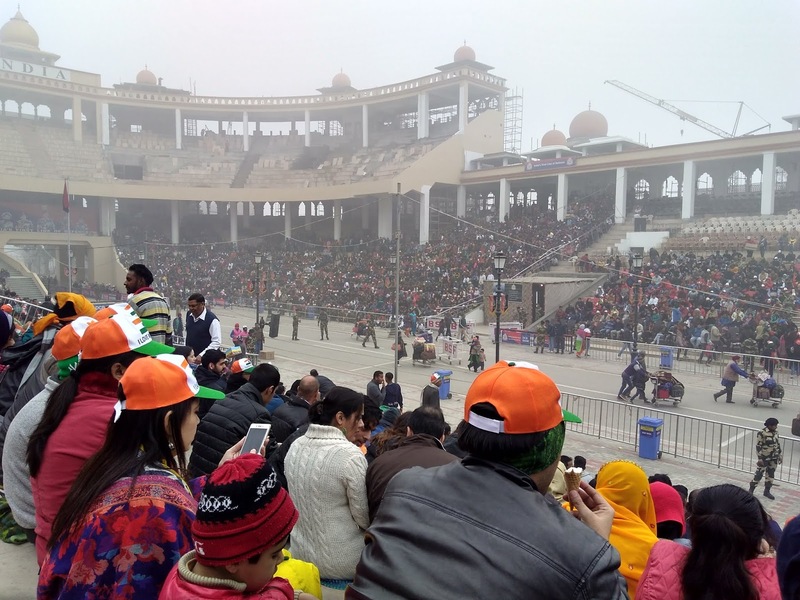 No visit to Punjab would be complete without a visit to the Wagah Border to see the changing of the guard on the border between India and Pakistan. Thousands of Indians turn out and the ceremony has turned into a mock-aggressive theatrical performance with an MC whipping up the crowd, patriotic chanting, deafening Bollywood music, and strutting guards shaking their fists at each other in a choreographed performance. The turnout on the Pakistani side was smaller and quite subdued compared to the tamasha (spectacle) on the Indian side. The seating, originally built to seat an equal number of people on both sides, is now being extended on the Indian side to greater heights. I originally passed through this border in 1978, at the end of an overland trip from Crete, where I had been teaching English for two years, to Bombay (as was) to visit my father after an absence of eleven years. At that time there were two long sheds in no man’s land, one Indian and one Pakistani. In the Indian hut customs officials searched our bags for marijuana, while outside the windows we could see that the area behind the hut was a forest of six foot marijuana plants (possibly seeded by grass thrown away by panicking hippies). A handsome Sikh soldier checked my passport, smiled at me and said, ‘Welcome home, Urmilla,’ and I can still remember that first experience of belonging and feeling welcome. A few years later I would feel it again when I visited my father’s village for the first time in many years and people seeing me walk down the street came out of their houses to welcome me, guessing that I was Iqbal Bahadur’s granddaughter. Belonging is such a powerful human need, and I wish everyone could be extended a welcome like that when they arrive in another country.